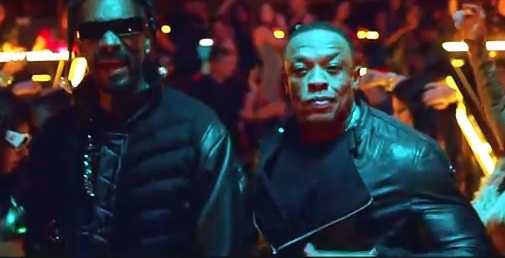 *A music video for “Kush,” the lead single from Dr. Dre’s long-awaited album “Detox,” hit the Internet this morning. Featuring Snoop Dogg and singer Akon, “Kush,” leaked online last month and positive feedback demanded the label run with it, according to EW. In the clip Dre and Snoop hit the club to spark up some fun while Akon makes it rain in a private jet cruising over the city. The trio are the only ones moving throughout most of the video. Motionless party-goers are seen enjoying various facets of after hours fun, be it exhaling puffs of smoke, knocking back a drink, or dancing. Flight attendants are frozen, as is the cash Akon tosses up on his plane. Dre?, is STILL the BEST beatmaker!!! And?, does the subject of “weed/smoking” make Snoop spit better in this muthafah or…what!!??? The might be the best he’s spit since Pharrel’s..”Drop it like it’s haaaaaaaaawt”! Actually to “me”?, it’s better than “that”! “Dre” day, alllllll day, foeEVVA!